A baby sits on his father’s lap for a checkup and the doctor shows him two syringes for his routine vaccinations. He leaves the caps on the needles and drums away at the child’s squishy thighs, then the father’s leg, then his own leg, complete with silly sound effects. This earns him some giggles and gets the little one comfortable with the instruments. In a few swift motions, he uncaps both shots and administers one to each leg. Before the baby can cry, the doctor snatches up a nearby box of tissues and flings them, one at a time, so they fall softly over the baby’s face. Laughter fills the room and immediately the needles’ pinches are forgotten. Viewed more than 5 million times, this viral video — called “Baby laughing while getting shots” — is a perfect example of nonpharmacologic pain relief, according to Phyllis Hendry, MD, a University of Florida College of Medicine – Jacksonville professor of emergency medicine. Hendry is using her experience as a pediatric emergency physician at UF Health Jacksonville, and her background in adult and pediatric hospice and palliative care, to educate physicians about treating pain without prescription painkillers. 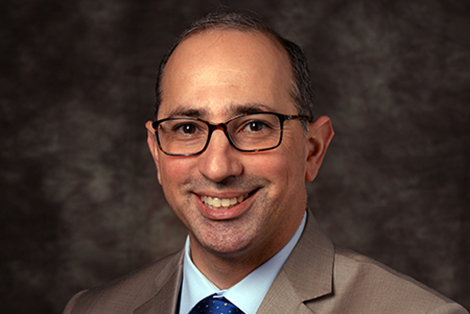 Hendry and fellow researchers created the Pain Assessment and Management Initiative, or PAMI, an educational project available free online to any health care provider interested in learning about alternative pain relief. Course materials and resources were developed with the help of organizations, such as the American Chronic Pain Association, Florida Hospital Association and Florida College of Emergency Physicians. 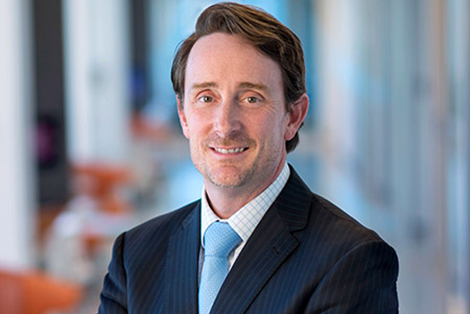 The goal of PAMI is to improve pain recognition, assessment and management in patients of all ages and create resources that can be used by hospitals, emergency departments and primary care practices. The online materials include guides on nonpharmacologic pain relief techniques and suggestions for building distraction toolkits for pediatric patients. All of PAMI’s nonpharmacologic pain management methods are rooted in the evidence-based idea that the brain can only focus on so much at one time. That’s why using distractions to divert attention away from discomfort and onto something positive can be as effective as taking medication. 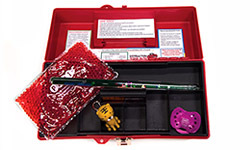 PAMI has developed distraction toolboxes filled with items to amuse pediatric patients during uncomfortable procedures. Housed in a little red toolbox, the kits include glitter wands filled with floating shapes, sucrose solution for dipping pacifiers, LED light keychains shaped like animals, Mad Libs, bubbles, stress balls, Rubik’s Cubes and more. A list of suggested items is available on the site, but Hendry said providers should use items that can be given away or cleaned for infection control. Providers can carry a toolbox from room to room as they see patients. Kits can also be tailored to specific locations, like in the emergency department waiting room or even the back of an ambulance. Similarly, getting young patients involved in their care can distract them from most aches, pinches and pokes. Hendry said it can be as simple as letting them pick out their bandages. She shared one example of a young patient who needed a dressing changed on a wound. In order to mentally engage her, Hendry and the patient both held tongue depressors and pretended to frost a cake as Hendry applied ointment to the injury. Both patient and parents were all smiles. 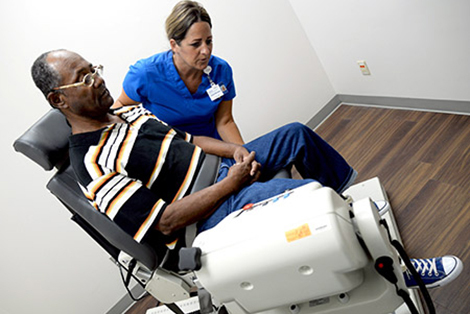 Comfort positioning is another technique that can be very effective when used during procedures like blood draws, injections, IV insertion and nasogastric tube placement. A parent holds their child securely, which provides comfort while also immobilizing the necessary limb or extremity. This allows parents to be positively involved and keeps the child sitting upright, so they feel less vulnerable than when lying down. Hendry says swaddling an infant is a good example of this, or even allowing babies to nurse during their care. Language changes and psychological preparation are even easier methods to incorporate. “Anxiety and pain are twins, so if someone is anxious and has no idea what you’re doing, it accelerates the pain. You have to give them some context,” Hendry said. Rather than a vague explanation, such as “now I’ll be taking some blood,” PAMI course materials suggest providers describe each step in sensory detail, from the nurse cleaning the arm with a cold alcohol pad, then applying a tight band to find a vein, and so on. After a procedure, rather than saying, “I’m sorry” or “Don’t cry,” physicians should praise the patient on what they did right, like holding still or breathing deeply to stay calm. Therapeutic conversation is a similar, common distraction method for adult patients, and uses simple conversation starters to refocus a patient’s attention away from an uncomfortable procedure. “You can’t think about two things at one time, so you can’t answer, ‘What are your hobbies?’ and feel pain at the same time,” Hendry explained. For example, aromatherapy with peppermint oil can be used to treat neuropathy and inflammation, and lavender is known for its relaxing properties. Patients with chronic pain can seek relief through massage therapy, acupuncture or physician-approved exercise regimens. Meditation and guided imagery may also help by diverting attention away from the discomfort and reducing anxiety. For physicians with adult patients, PAMI offers a set of videos to view together during an exam or for the patient to watch at home after they are discharged. They cover medication safety, chronic pain management and more. The site also has a two-sided document listing interactive apps and movies. For more information about nonpharmacologic pain relief or to take online pain management courses, visit pami.emergency.med.jax.ufl.edu. 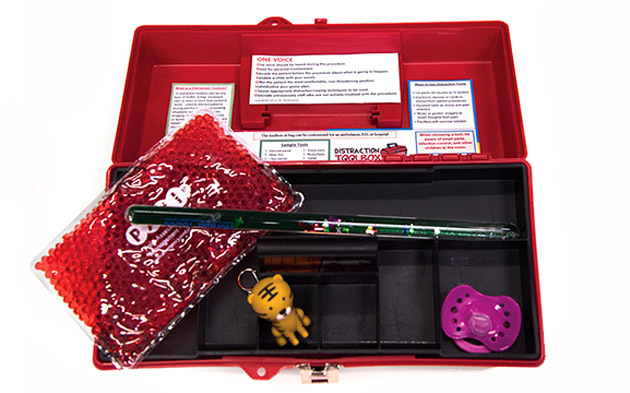 The PAMI distraction toolbox contains items like glitter wands filled with floating shapes, pacifiers and roaring animal keychains.